When I was a little kid learning to draw, I always had the deepest admiration for comic book artists, along with a profound misconception. Upon actually purchasing a Marvel, DC, or later an Image publication, the reader sees only crisp, perfect drawings, with no construction lines. You see, many artists proffer an illusion. There are several steps to making a comic: In the first step, the artist sketches out a rough with a pencil, complete with construction lines (often this is done on a much larger scale than the final page, so large errors appear small when it's printed). Second, an "inker" comes in and goes over the rough sketch with a pen, darkening only the ideal lines and ignoring errors. Then finally, the "colorist" lays a palate of color over the work. So for the viewer, the final result omits much of the work that went on in making a "perfect" layout. This sort of trickery is pervasive in art, where artists ranging from Van Gogh to Vermeer may have used a variety of tools like the grid or the camera obscura to attain accurate proportions. Thus a subterfuge has been pulled over the eyes of the viewing public, who are left thinking that artists possess talent beyond their own, when actually a lot of the work that went into art has been erased or covered up and reworked with oils. 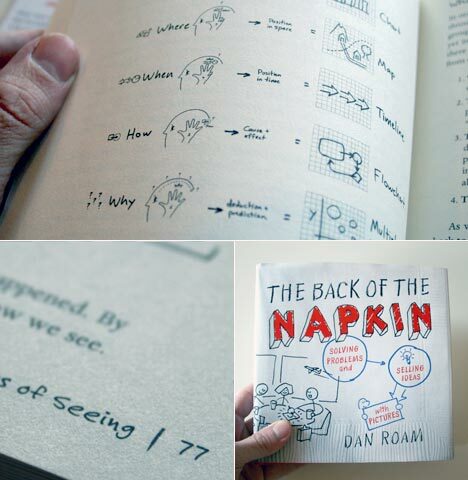 As someone who has gone to art school and seen that the act of repetitive practice can turn a mediocre sketcher into someone the world sees as "talented," I have no trouble understanding where Dan Roam is coming from in his book The Back of the Napkin when he speaks to his readers about visual thinking. Frankly, it doesn't matter whether or not people can draw when they present their ideas. All the errant lines and mistakes that they make when drawing under pressure contribute to a sense of immediacy and urgency in the final product. Roam is a consultant by trade, and I trust that he won't take offense when I say that while his "back of the napkin" sketches lack the technical prowess of a Rembrant or DaVinci, his simple line drawings are clear, concise and evocative of the emotional verve one sees (and casually discounts) in the "funny pages." 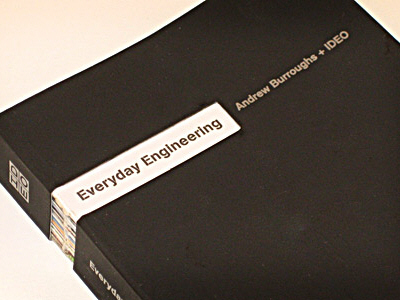 This, of course, is precisely the point of his book: simple sketches are often more compelling than technically adept Power Point slides.The book is broken up into four sections and two technical appendices. Interspersed within the text are countless line drawings to be used as reference. Apropos to the central thesis of the book, it actually becomes quite difficult to read through the text, pause to look at a graphic and then return to the text. Instead, the reader will likely read through the text while blurring over the sketches and then stop to focus on one or two charts in detail. 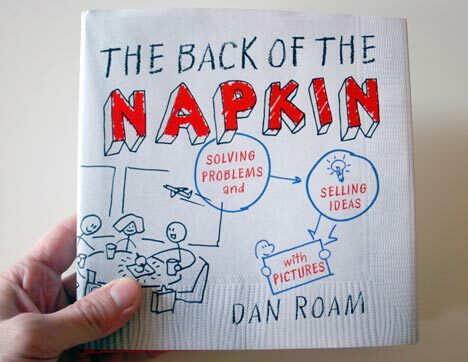 In his "Introduction," Roam explains the fundamentals of visual thinking using the napkin as both a metaphor and a visual cue. While many of us feel that we can't draw, the same isn't true of kindergarteners. Who's wrong? Well, using sketches not that much better than a primary school student's, Roam demonstrates that neither is wrong. It's just that adults have forgotten how to express themselves visually. Roam then literally illustrates the breakthrough experience that led him to his conclusion. 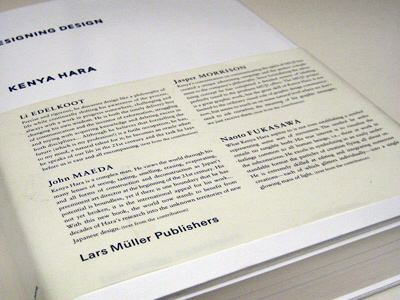 Part two of the book: "Discovering Ideas" is exceptional. Here, Roam lays out the toolkit that any executive or designer should have in his or her arsenal to use visual expression as a presentation device. As anyone who's looked at spreadsheets or typical presentation materials can attest, rows of numbers or pages of bullets are often enough to make one's eyes glaze over. Since the book is targeted at a general audience, he next explains which visuals should accompany which concepts such that the audience is neither bored nor confused. One sketch, in particular, is among the best encapsulations of how to present thinking in a visual manner that I've ever seen. Part three, "Developing Ideas" walks the reader through not when, but how to use the tools Roam has provided. I was pleased to see the progression from a blank napkin to a visual discourse on problem solving. Since a blank page can be intimidating, The Back of the Napkin actually walks the reader through this process, starting with a blank napkin and then drawing the most important part of the puzzle right in the middle of the page. Much as I once taught my CAD students, it's hard to go from directly from concept to finished product. Instead, the easiest beginning is to start with what you know. So if a student was designing a couch and came to me confused by the number of ways to approach the problem, I'd begin by asking them what they knew about their couch. Usually either the footprint or the seat-height was definite. So I'd have them draw the footprint on the ground plane â€¦ from there, the next step of the problem was at least a little clearer. Roam takes the same approach: Want to draw the competitive landscape? Well, start with yourself, because after all, you know you're there. Then the rest will follow quite easily. The fourth chapter of the book, entitled "Selling Ideas," explains how to make the transition with which the reader may already have had subconscious trouble. 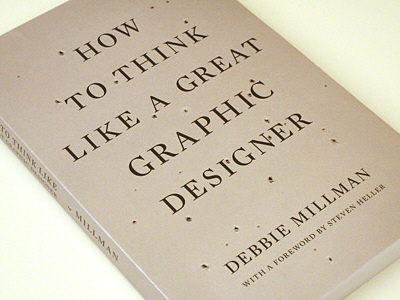 Just as it's occasionally difficult to rapidly transition from the text of the book to the graphics and back, when thinking has been done visually, it can be tough to explain it in words. Using the case study method, Roam talks (and shows) the reader just how to do that with ease. By the end of the book, I had no doubt that hearing or seeing a presentation from Dan Roam would be a compelling experience. My only regret is that he wasn't here to narrate it for me, because at times it became difficult to navigate between the text and the graphics. There was simply too much information here to have portrayed through one channel alone. Perhaps the best complement I can give is that by the end of reading it, I would have loved to have seen an all-graphics version of the book as well; and saying that about a non-artist's work is high praise indeed. Roam explains some 90 % of the book in some 60 minute presentation. If you have already seen this presentation, sorry to bother you. Thanks Rob--I mean it: THANKS. Yours is just about the most heart-felt and deepest review I've myself seen of the book. I had a great moment yesterday: I had the chance to address the Senior Management Association of Boeing Commercial Aircraft up in Seattle, and take them through many of the lessons and sketches live. Anyway, that meeting alone made all the work on the book worth it. Seeing a review like yours doubles the happiness.